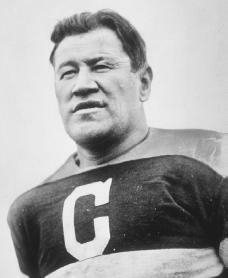 Interesting story in the Pocono Record: Jim Thorpe lose its namesake? Grandson speaks out. Jim Thorpe's sons Jack, Bill, and Richard want to move his body from Jim Thorpe, Pennsylvania, to the family burial ground in Oklahoma. They're suing based on the Native American Graves Protection and Repatriation Act, which "provides a process for museums and Federal agencies to return certain Native American cultural items--human remains, funerary objects, sacred objects, and objects of cultural patrimony--to lineal descendants, culturally affiliated Indian tribes, and Native Hawaiian organizations." Opposing them is Thorpe's grandson Michael Koehler, who takes the position of Thorpe's three daughters and the Borough of Jim Thorpe, which wants to keep the body. Thorpe's grandson explains the differing positions taken by Thorpe's sons and daughters:"Jack identifies with the spirituality of the Native Americans. He wants to return his father's body to his tribal resting ground in Oklahoma. He wants to perform an Indian ceremony in which tobacco is spilled into the grave, because he feels, as do most who believe in Indian spirituality, that his spirit is still not satisfied—it's roaming free and it needs to be back in Oklahoma, and he wants his body back in the tribal ceremonial grounds. "That's what Jack believes and, fortunately or unfortunately, I'm not sure which, I don't tend to adhere to that. I have felt all along that my grandfather has been well-served by the folks in Jim Thorpe, Pennsylvania, and I know that my Aunt Grace, my Aunt Gale and my mother, Charlotte—although my mother never got into it as much as they did—felt the same way. "Comment: Haven't heard NAGPRA used as a reason to disinter and move modern Indian remains. Could be an interesting case if it ever makes it to court. For more on Thorpe, see Values.com's Jim Thorpe Billboard and New Jim Thorpe Documentary.